CHICAGO - Twelve people were killed and at least 43 -- including a 4-year-old girl -- were wounded in shootings across Chicago during Memorial Day weekend, reports CBS Chicago. The 4-year-old, identified by her family as Jacele Johnson, was shot around 8 p.m. Friday. She was inside an SUV with her 17-year-old cousin, Romare Wilson, when another vehicle pulled up and someone inside opened fire, according to their family and Chicago Police. The child was shot in the head and taken to Comer Children's Hospital in critical condition, authorities said. She has since been upgraded to fair condition, a hospital spokeswoman said Monday morning. The 17-year-old was shot in the chest and grazed by a bullet in the neck. He was in serious condition at Advocate Christ Medical Center in Oak Lawn. A 15-year-old girl standing on a sidewalk nearby was shot in the forehead and was taken to Stroger Hospital, where her condition stabilized, police said. The shooting was at the start of a weekend that sent police, EMTs and the county Medical Examiner rushing from crime scene to crime scene. Police departments across the country are typically on high alert during Memorial Day weekend, the unofficial start of summer -- when many cities see increases in violent crime -- but this year Chicago experienced considerably more violence than last. During Memorial Day weekend 2014, six were killed, and 22 were wounded in Chicago. One shooting was captured on a vehicle's dashboard camera Saturday afternoon. 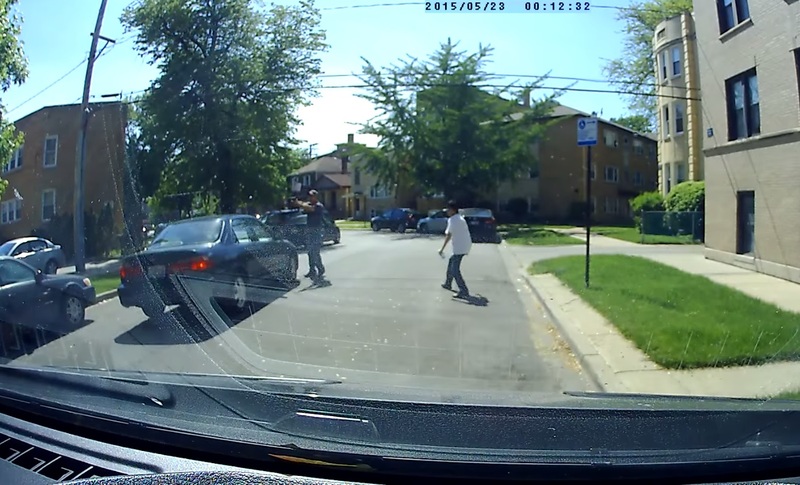 The video shows a man firing a gun, while standing next to the passenger door of a car. After he fires several shots, the car speeds ahead, then the gunman runs after it, and gets inside. Chicago Police say officers responded to the call of shots fired in the area, but no arrests have been made. The holiday weekend's final shooting occurred Monday night at about 7:50 p.m., when a 17-year-old boy was shot in the back and the leg, police said. He was taken to Mount Sinai Hospital, where he died. About 2-and-a-half hours earlier, a 19-year-old man was shot in the back, less than two blocks south of Chicago Police headquarters. The man was taken to Stroger Hospital, where he died, police said.